Finding bookcloth in colours I love is much easier these days. In part because there are more suppliers that ship to Finland at a reasonable price than before, but also because I find myself enjoying colours more than I used to. Although I still tend to wear pretty much black and grey... Anyway, this week I decided it was time to add a bit more variety to what I've been up to. You've really liked the long-stitch bullet journals with dotted grid pages, but every now and then I also get requests for similar books with blank pages. 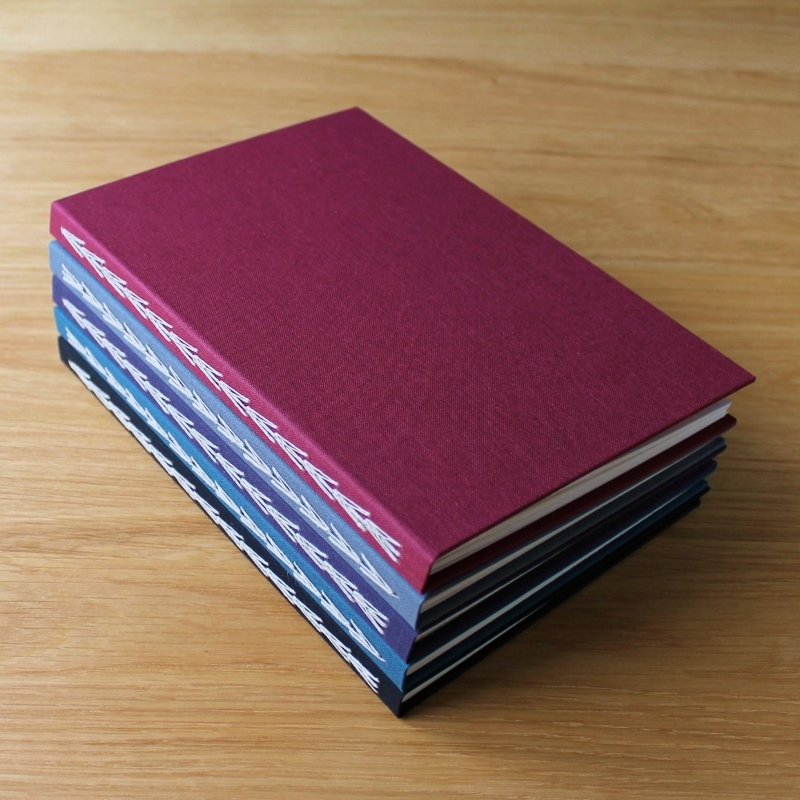 And here they are, blank pages in hard covers (in delicious colours! ), sewn into notebooks using a long-stitch chain variation. These books measure approximately 15x21,5cm / 5.9"x8.5", or around the size A5. They have 72 pages of 90gsm drawing paper suitable for most pens and dry media. You can find this lot in the Paperiaarre shop. Next up on my to-do-list is a small lot of tall but slim sewn board binding notebooks with linen covers. And some with gold linen spines, too. I'm also itching to make a collage for a change, but we'll see... Maybe a small box, or a pendant, as a gateway into making some larger pieces after the matchboxes I made for December. It's a world of its own, making those tiny things! Even on snowy days it feels like summer is only a leap away. For a terrible sleeper and chronic night owl like me it's wonderful to wake up and still have hours and hours of daylight left. I still do my best creative work late in the evening, but I find ideas come to me more easily when there's been also light to balance off the darkness. I hope all is well with you and you're enjoying the February light wherever you are!